It’s almost time for #OctoberScopers and I am so excited! 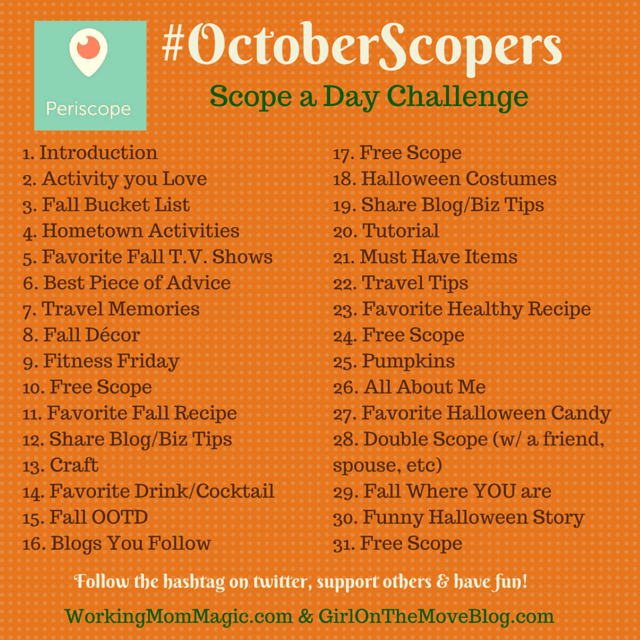 When Julie and I came up with #SeptemberScopers we had NO IDEA what a huge hit it would become! It has been so much fun meeting new people through Periscope… and I also feel an even closer connection to bloggers I have been following forever! It is really amazing how much you get to know a person while watching their scopes! This time around, we tried to create a more diverse selection of topics. We wanted to include a few healthy eating, fitness type prompts for our fitness buffs! We also thought people did well with tutorials & crafts, so we have a bunch of those. 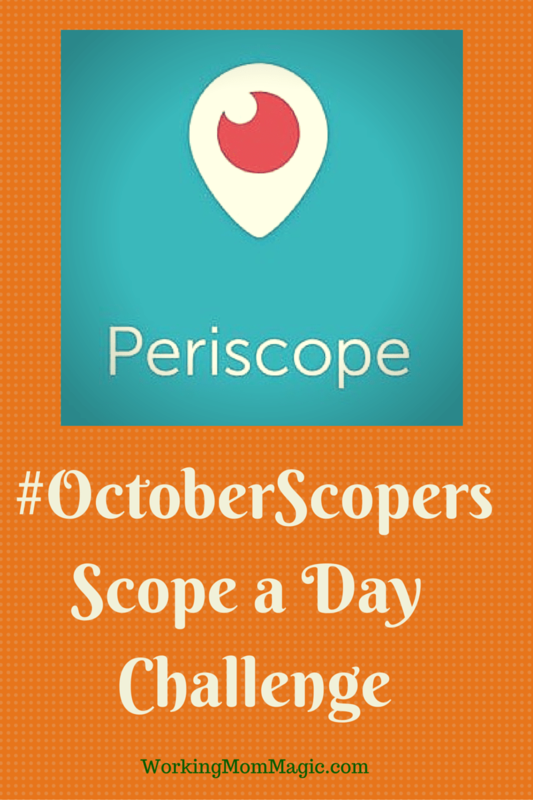 Don’t forget to include the #OctoberScopers hashtag in your title and share to twitter. That is how we will find your scopes! You don’t have to follow the exact prompts. Just include the #OctoberScopers hashtag and we will find you! Don’t feel bad if you can’t get to everyone, there is A LOT of participants, so just do your best. Catch replays when you can and if you can hop into a live scope… even better! To connect with everyone taking part in the challenge, we have created a Facebook group called Scoper Support. The group is set to private, but anyone can join! My Periscope handle is @WorkingMomMagic. I look forward to watching your scopes! Woo! #OctoberScopers I am having way too much fun getting to know you all. Can't wait!! Would love to join the FB group! I was just reading about this on Tarynn's page. I am definitely going to check out your scopes this month. I think it may be too much for me to join in with the baby due next week, but maybe I'll start if you do it again for November. I love this idea! I have a Periscope account but haven't done it yet. There is something about being on live video that intimidates me. But I love watching oters, so I really need to take the plunge. Awesome! I love watching these.. Still not down for doing them myself though lol! This is such an amazing idea. I am going to be trying this come October as I will be starting maternity leave!!! What a great idea! If I ever get the courage up…and my hair done…I'm in! i LOVE the topic ideas, I wasn't sure if I could hack it since I TOTALLY failed September Scopers but you are really inspiring me!